There are an infinite amount of desserts around the world worth trying, and as someone who has a bit of a “food problem” I can tell you I have no problem trying most of them. But I do have a bit of a quirk: I don’t like chocolate. I’ll eat chocolate, but I really never crave any. However, the way most people feel about chocolate is precisely how I feel about coconut. And when I saw a particularly awesome coconut-filled dessert in Bangkok, I knew I had found the best dessert that my baht could buy. I’m going to go out on a limb here and venture that it is the best 80 cent dessert on earth. 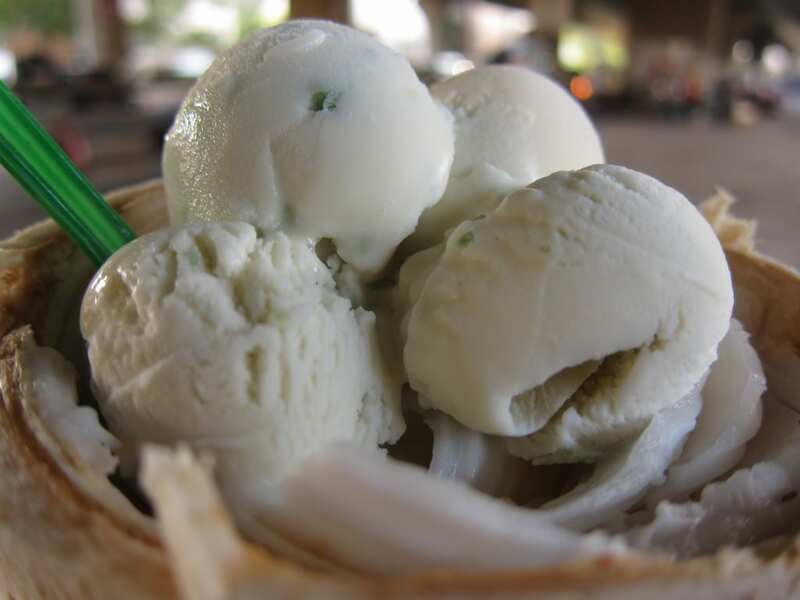 Which is half of a young coconut filled with coconut ice cream, young coconut pulp and coconut chunks in the coconut ice cream. And that, my friends, is what I call a perfect dessert.